Halloween is less than 24 hours away. So AESU, the most trusted name is travel, is celebrating the best way we know how: by highlighting the creepiest, crawliest, and spookiest attractions from around the world. So far we have explored the scary side of Scotland, Budapest, Venice, and Amsterdam. This week we are going to journey through the streets of Athens. 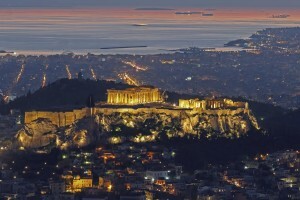 Have you always dreamed of visiting Athens? If so, AESU’s Discount Greek Vacations can help make your wish come true. And if you pay in full before Halloween (October 31st), you can save up to $300! So what are you waiting for? Click Here to find a trip that is right for you. If you still need a little convincing, let’s stop and take a look at the haunting history of Athens. According to locals, a young girl named Anna can often be seen crying just outside the cemetery. Passersby have claimed to see her in their car mirror, but when they look back, she’s gone. Vanished! This is one of the most famous ghost stories in Athens. This cave is said to be a center for paranormal activity dating back to the days of ancient Greece when the people attributed these strange happenings to the gods. Over the years, there have been numerous reports of UFOs, strange creatures, and paranormal activity, probably due to electromagnetic fields in the area. Daveli’s Cave is a great site for novice ghost hunters. The Island of Poros, a small volcanic island-pair, is a popular summer getaway among both Greeks and tourists. It also has a pretty fascinating history…if you believe the legends. According to ancient Greek mythology, when the Cretan King Minos was fighting the city of Megara, the daughter of King Nisos, Scylla, fell in love with the Minos. To prove her love, she cut off a lock of her father’s hair – the source of his immortality – and stole the keys to the city gates, both of which she gave to King Minos. Unfortunately, Minos spurned Scylla. Heartbroken, Scylla swam after King Minos as he sailed back to Crete. Eventually, she succumbed to exhaustion and drowned. To this day, the spot where Scylla drowned is known as Cape Skyllaio or Cape Skili. AESU offers unique, exciting travel programs for college students and young professionals at affordable rates. Each trip is action-packed and informal—designed just for people your own age. Our Greek Island Odyssey is an exciting nine day through fabled Greece. Click Here to book your Greek getaway with AESU! Want help booking one of our Discount Greek Vacations? Please contact AESU by calling 800-638-7640 or fill out the contact form found on our website. And don’t forget to check out all of our great Travel Tips, especially the Travel Tips for Europe, before you head overseas. This entry was posted on Thursday, October 30th, 2014	at 3:13 pm	. You can follow any responses to this entry through the RSS 2.0	feed. Both comments and pings are currently closed.